When Vaccine first made an appearance, it wasn’t as welcomed as it could have been. When it came to Wii, its reception is even chillier, but now that the game that is clearly a homage to the original Resident Evil game, is out on Switch, the hate for it is sub zero! But is the hate that Vaccine is getting, justified? The answer to that question is precisely what I will be aiming to answer via this review, because yes Vaccine is something of a poor title, but how about this time around, instead of being another review that just moans about the negatives, it talks about them, talks about how they could have been better and actually praises on what the game does right? Sounds good to you? I thought it would. So first up, let’s talk about the whole Resident Evil thing and its choice of graphics. When the first Resident Evil game came out, it was fresh, cutting edge and certainly pushed the envelope a little bit at their. As for its graphics, well it was the 90’s so the graphics were what you could expect from a 90’s made game, and while retro is in fact in, Vaccine’s developers probably should have invested more in the suspenseful side and true chill factor the Resident Evil games possess, instead of mirroring its graphics. Do not get me wrong, I like the old look to it, it works. Text could have and probably should have been made a little clearer with a little more time spent on correcting the text to eliminate the typos, but sometimes the best horror movie/game is one that isn’t even in English in the first place, but while Vaccine has the right music and tries to mirror the horror, the chill and the dread a good Resident Evil gives its players, the most important thing was forgotten, originality and maybe a more enticing story. Not every horror needs a good story behind it to drive it, but it should at least have something a little more substantial than “Despite all your efforts, your friend got infected again. Find a Vaccine before the time runs out” because that’s all we have in terms of story. There is no elaboration as to why exactly your friend got infected, or how it happened. Even, should you be able to reach it, experience the end and the true end, there isn’t really anything substantial there, which is a shame. Had there been a bit more to the story other than what I’ve shared already and the occasional piece of paper you can randomly encounter that details various events players would be more driven to at least try to reach the end. Why try? Well there is no guarantee you will make it to the end. In fact it is far more likely that you will die three times in a row, not lasting a second longer than 7 minutes as opposed to you surviving for at least 19 in a single playthrough. Vaccine isn’t just hard, it is insane and I actually like that about the game. While it does fall short in a lot of places, like certain not being anywhere as noticeable as they could have been, even when the game is set to its brightest setting, it does have one heck of an original trait to it. A trait that is a ticking clock counting down from 30 minutes for you to achieve your goal in (finding a vaccine to cure your friend), in a house full of zombies and crawlers that changes every time you play it. I would like to say you get better every time you play through it, but you don’t. Yes you get smarter and you may think you can survive for another minute or two, but with the randomizer at play, the very first room you could walk into could be crowded with zombies and you die before you can even reach a door that will actually open, as opposed to requiring a key. Or you can be completely luck and have a few good rooms, gets loads of weapons and enemy and a have a few minutes of smooth sailing before one room proves a little too deadly and no matter how much you levelled up, death awaits. But like I said, I actually like that aspect, purely because it’s more real life than video game. If you’re in a house with a serial killer, wishing to do you harm, you can’t exactly wish they would go away for five minutes and appear in another room instead. They will strike when they strike and there is nothing you can do about much like the controls in the game. They are not good at all and while they could/should have been better, they’re not and what you see is what you get, but while Vaccine is a game ridden with more faults than it has qualities, I still think it’s enjoyable and deserves a bit of slack. So Vaccine is not the cure to that which ails us (the lack of a true and immensely enjoyable horror game on the Nintendo Switch,) but it is a good foundation, which if the developers spend a little more time working on, they could go on to make a really enjoyable follow-up. Sure listen to some fan feedback, but the devs did execute some good ideas, which if they spend a little more time thinking about, they could make into something so much more and because I’ve said enough, it’s time to wrap this review up. Is Vaccine a total Resident Evil rip off? No, not fully but it is in part, but to be fair, when it comes to horror, Resident Evil is one of those series’ that does it best! It’s understandable Vaccine would want to try mimic the game as best as it can, but don’t count it out just yet. Yes the randomizer can make the game very unfair, but it’s also what makes the game more real and more challenging, so no, Vaccine is not a bad game, it’s just a game with a smaller audience than most games has. So taking everything into account and evaluating it to the best of my ability, I am going to score Vaccine a 6/10. It may not be an absolute winner, but right now, it is the closest thing to an original Resident Evil game the Nintendo Switch has to offer and is the perfect game to play if you wish to really show off your skills as a gamer who’s played plenty of survival focused video games. 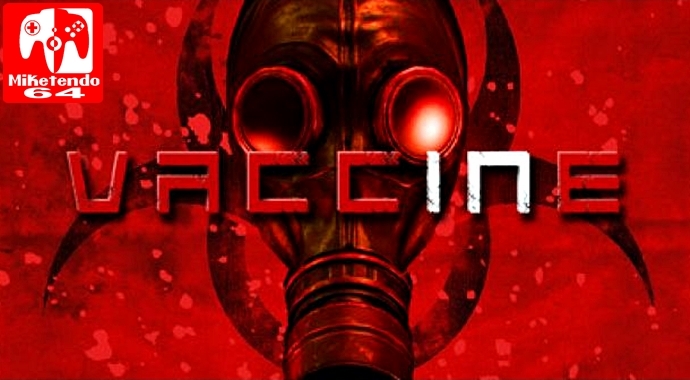 Now I’ve said my piece and so has everyone else, so if you are still on the fence, why not watch Vaccine in action and decide for yourself if it is a game you need in your life. It is after all your money and your time at the end of the day. I was honestly looking at this game as a possibility last week, but decided against it. The concept seemed pretty cool, but I enjoy a great story rather than a tough game experience. That’s why I never beat Dark Souls 1-3. I play them for about a week, get pissed, and never touch it again. I need a good story to drive me to beat a game. Great review though! Story is the most important thing to me in games as well but when you do reviews, you have to be willing to review games all of kinds and calibre. I can agree to that. I don’t mind playing a game…doesnt mean that I have to like it.